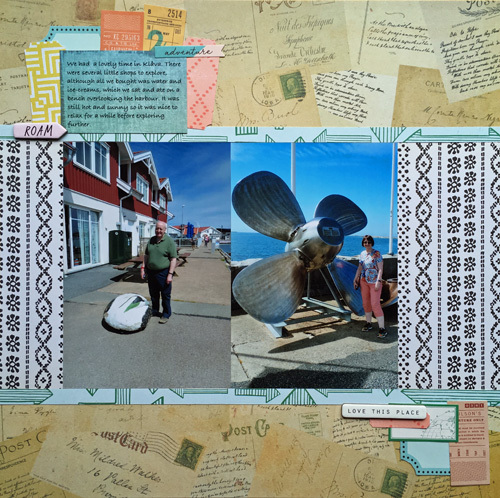 I did four layouts from our fourth day, which was a day at sea. 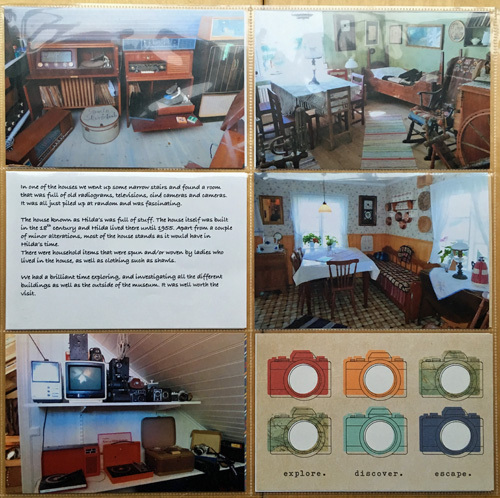 First the intro layout, which follows the same format as the others. 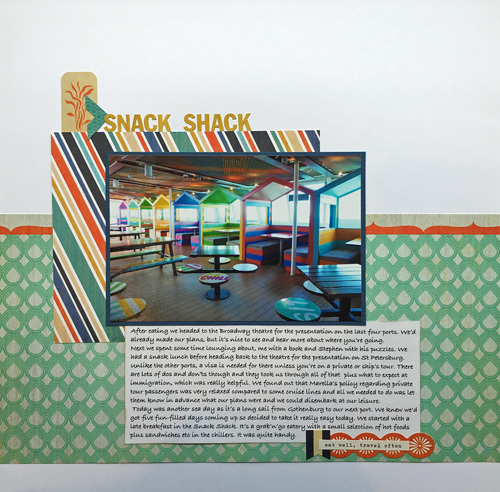 Next are a couple with photos of where we ate that day with journalling about the things that we did in between eating. Finally a layout to document the evening’s activities. 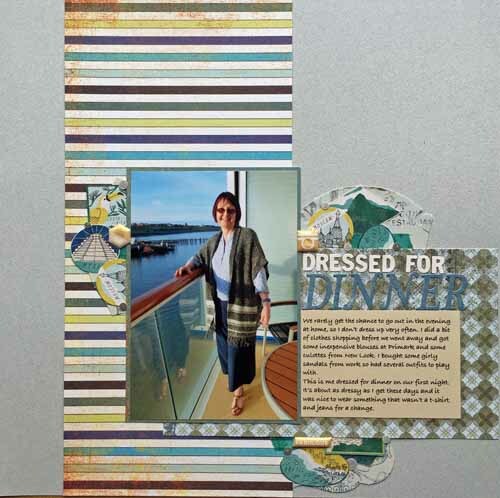 Categories: Scrapbooking | Tags: Baltic cruise, Marella Discovery, Scrapbooking | Permalink. 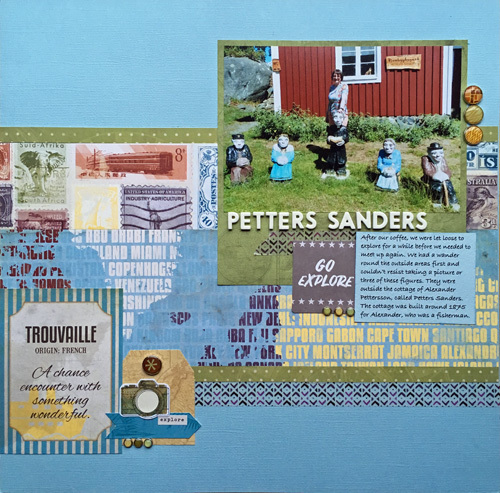 Final layouts from our Swedish adventure. 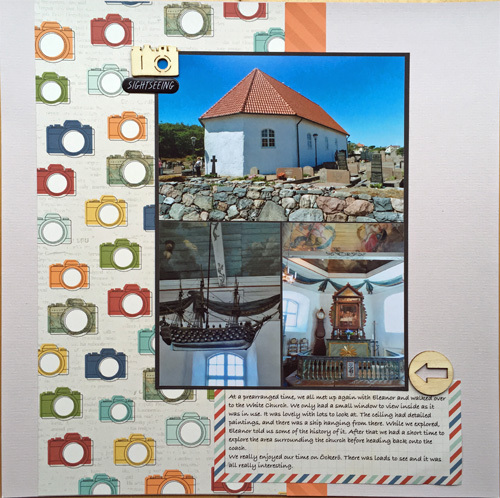 Two from Fotö Three from Hönö And one from on board the ship with journalling detailing the rest of our day. 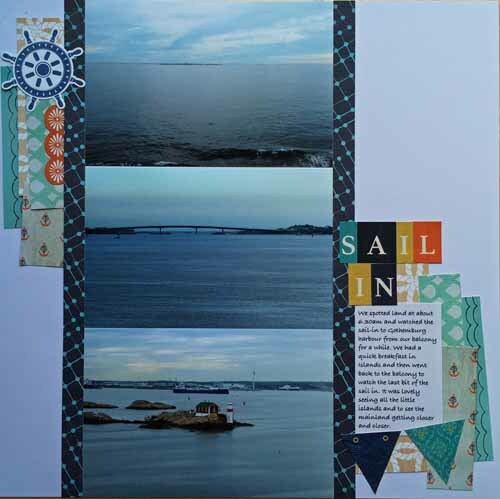 Categories: Scrapbooking | Tags: Baltic cruise, Marella Discovery, Scrapbooking, Sweden | Permalink. 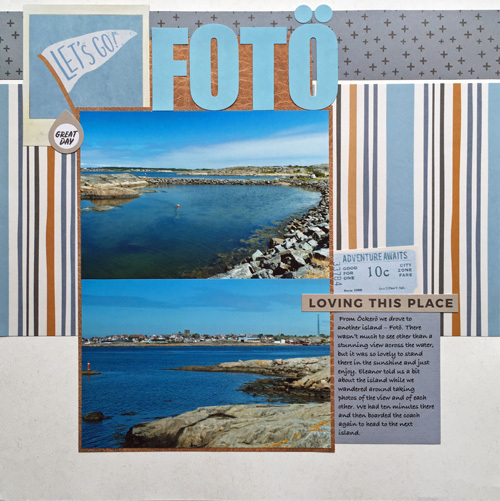 More layouts from our day in Sweden. 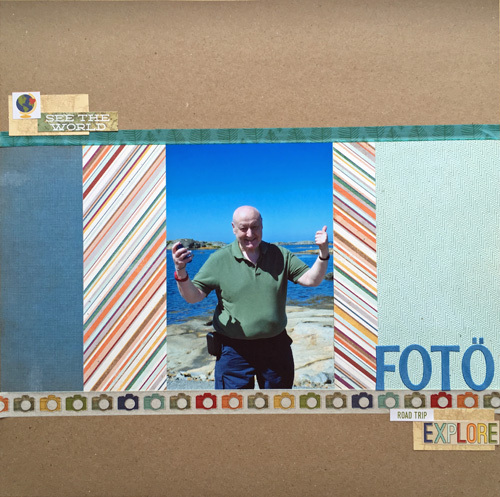 This is the first of several from Öckerö. We started off our visit there with a coffee and cake, which was laid on as part of our tour. 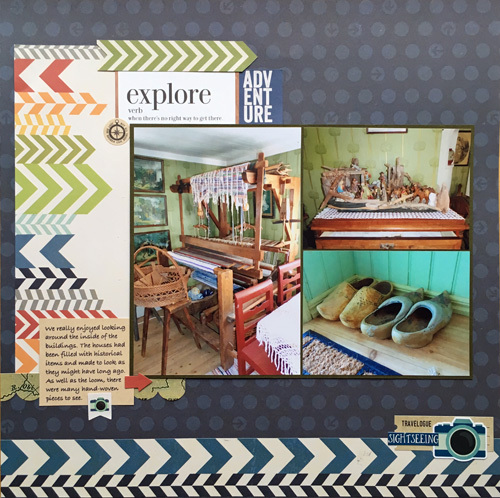 Then we explored the museum and took lots of photos. There were more photos than I wanted to, or had time to scrap so I’m using divided page protectors to get more photos in the albums. 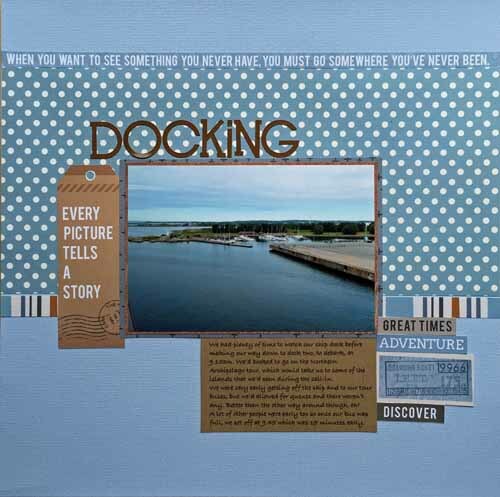 Some will be padded out with other things such as journalling blocks but some may have just photos. I used one for Sweden. Finally for Öckerö is a layout of the white church. I’ve finally got to the first port of call, which was Sweden. We had the best day out there and took loads of photos. 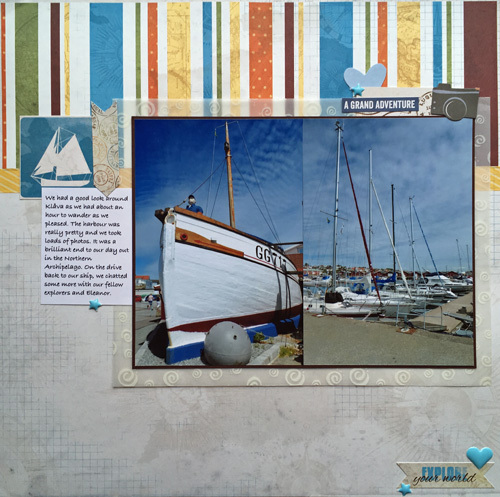 I’m scrapping all of my favourites, while still trying to tell the story of our day. I started with the intro page, with the same format as the earlier ones. 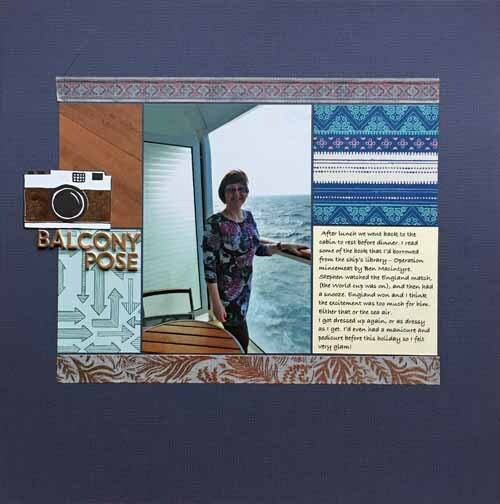 Next was the sail in with journalling about getting up early to watch from our balcony. 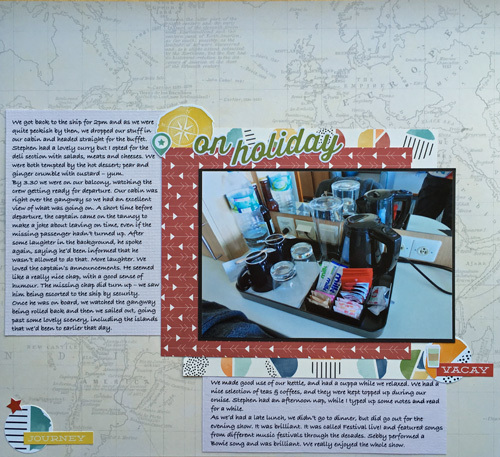 This layout has a photo from when we were docking with journalling about that and about getting breakfast and heading off the ship to join our excursion. 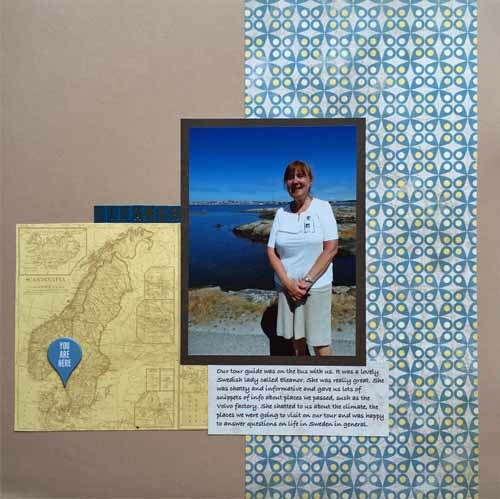 I wanted to do a layout about our tour guide as she was so lovely so the journalling on this is about Eleanor. 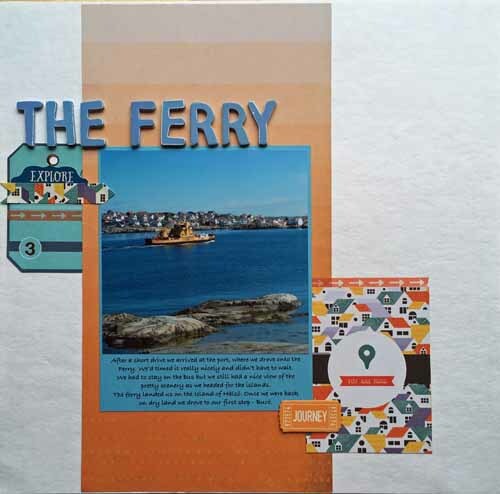 Our tour was to the Northern Archipelago so I took a photo of the ferry from one of the islands and used that for a layout about the ferry crossing. 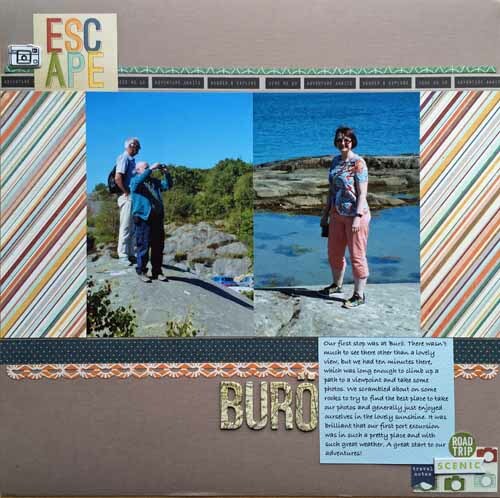 Finally, for this post, are two layouts about our stop at Burö on the island of Halsö. 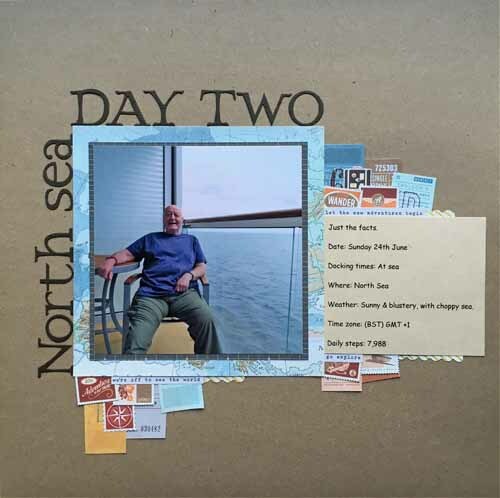 I’ve finished scrapping the second day of our cruise, which was the first full day and was spent at sea. 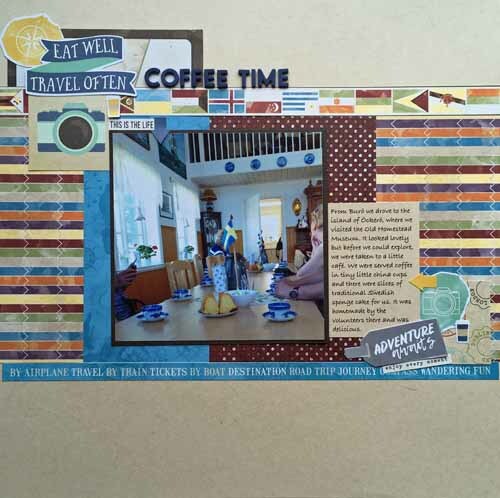 There are six layouts starting with the intro for the day. 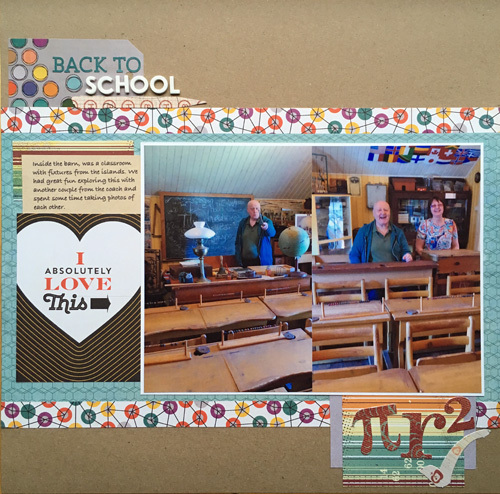 Once again, it has a square photo with a ‘just the facts’ journaling block. Next is about the restaurant where we had breakfast, plus what we had. 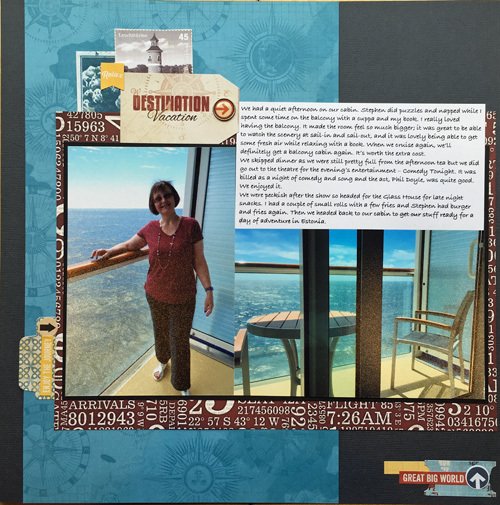 Then I did a layout about the maps by the central lifts and how useful we found them while we were finding our way around the ship. Some of the layouts are going to be very plain and simple, as otherwise I’ll still be scrapping this holiday in ten years time. 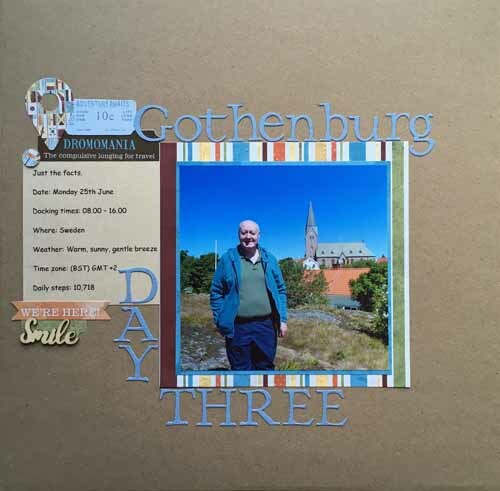 I will embellish some a bit more, but I’m comfortable with a simple style and the main thing is to get the journalling on there. The next one is about me getting dressed for dinner again, and waffles about how I even got a mani-pedi before travelling. (my first ever!) Finally, there’s a layout about our evening. 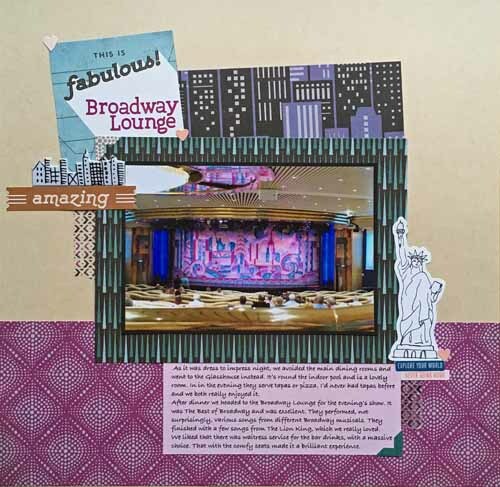 The journalling is about where we had dinner, and what we had, and about the evening show in the Broadway Lounge. 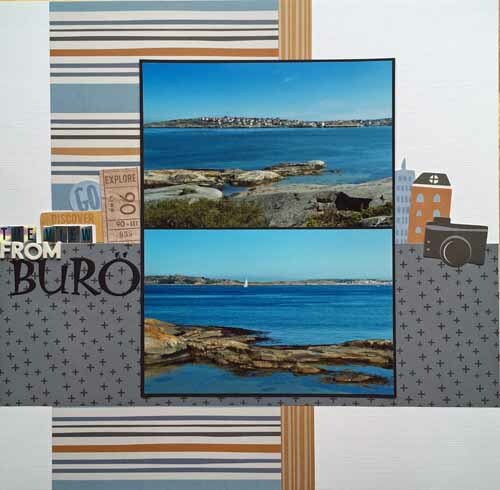 I recently added to my stash of travel-themed papers and embellishments with a pack of Basic Grey Second City. 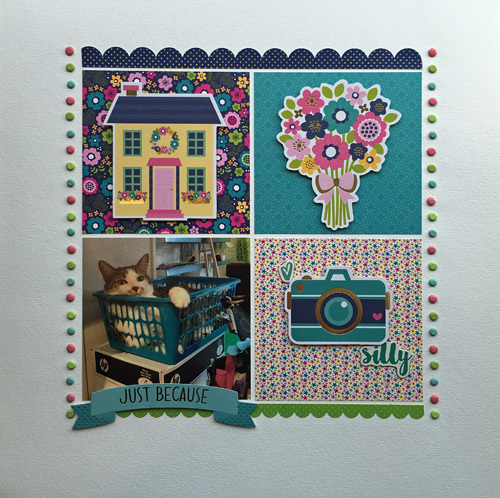 The theme and colours were perfect for this layout. 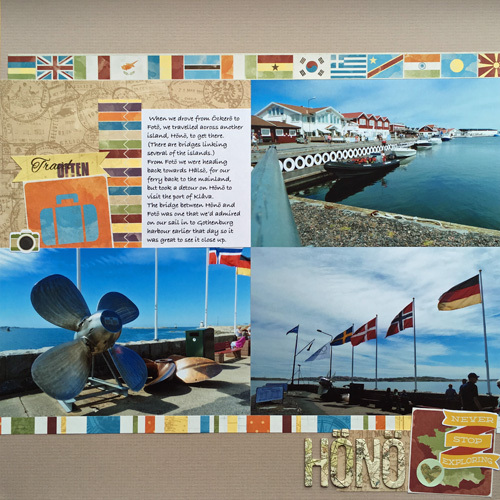 Next up is one of our port days – Sweden! 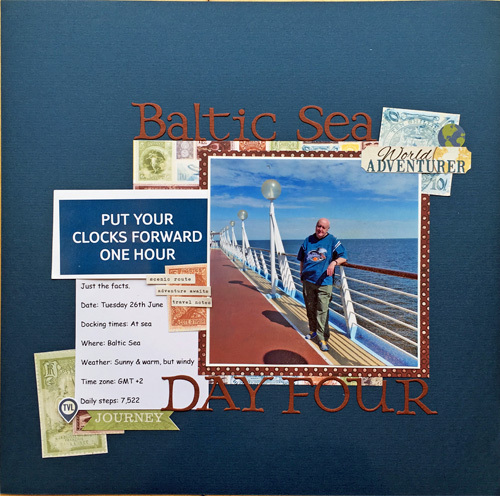 Categories: Holiday, Scrapbooking | Tags: Baltic cruise, Marella Discovery, Scrapbooking | Permalink. The first day of our cruise is finished. I’ve only done four pages for it though. This and the sea days are quite light on photos, but once I get to the port days, there are loads. Great fun! I’m starting each day with an intro page and they’ll look similar. 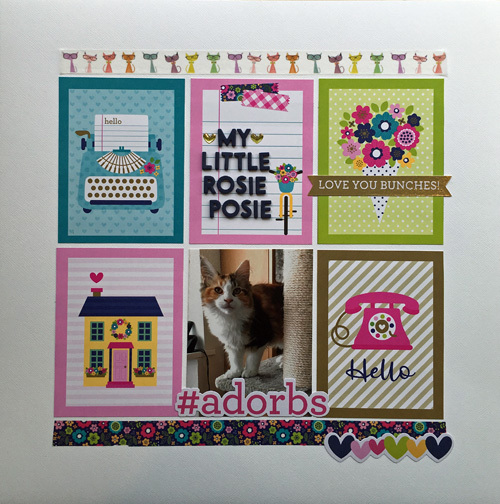 They’ll all have a square photo and a ‘just the facts’ journaling block. 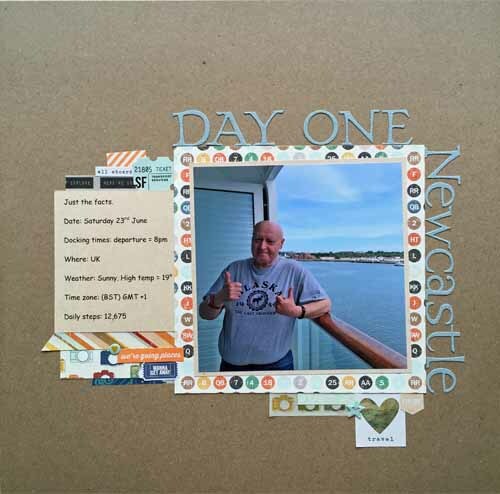 This is the intro page for day one. 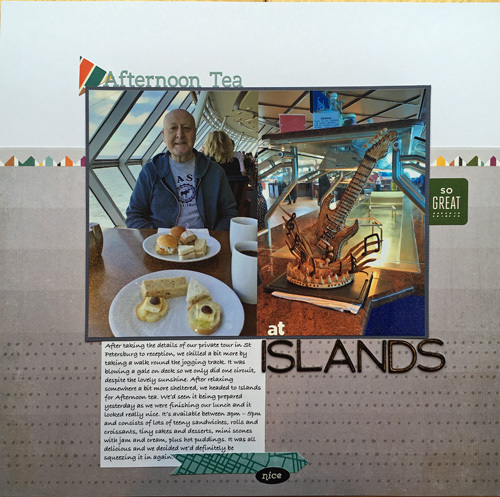 I did a layout with details of how our morning went and the embarkation process plus what we did once we got aboard. 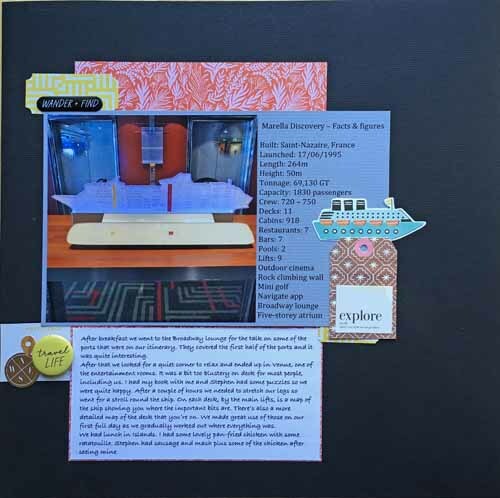 There’s more journaling on this than in whole albums that I’ve done before! 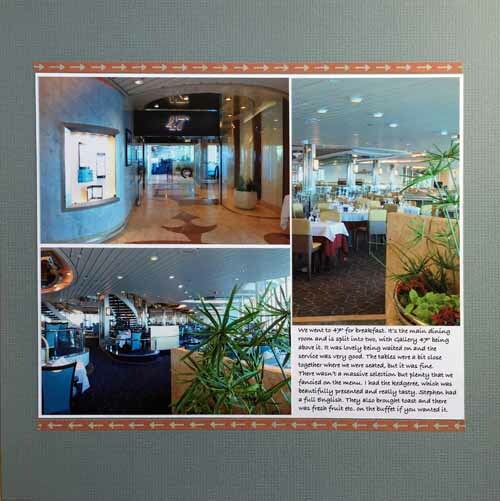 Photos are of the sail away. Next is a layout of me, all dressed up. The journaling is about how I never get dressed up these days and that this is very dressy for me. 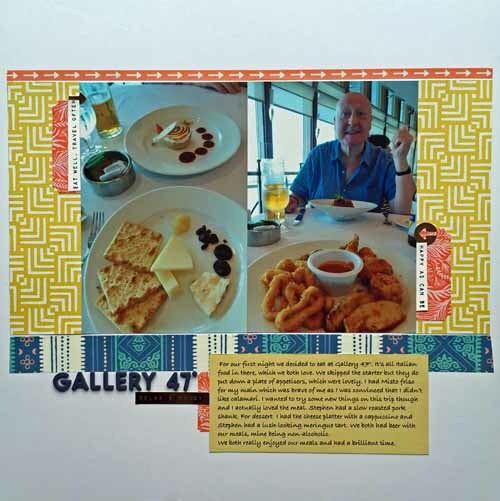 Finally is a layout of our first dinner on board – what we had and what we thought of it. 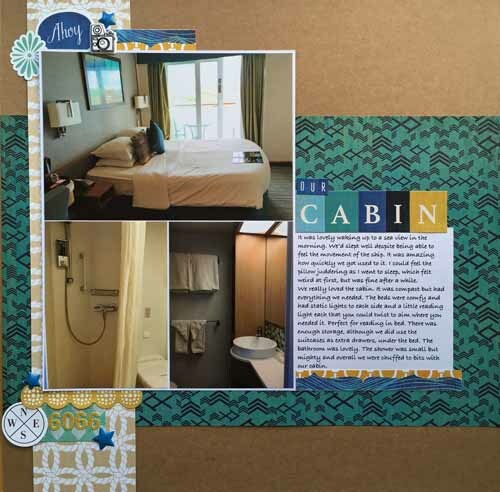 As you can see, the layouts are quite heavy on the journaling so far. Some won’t have much, as they’ll just be to showcase some photos that I love, and others will have lots. 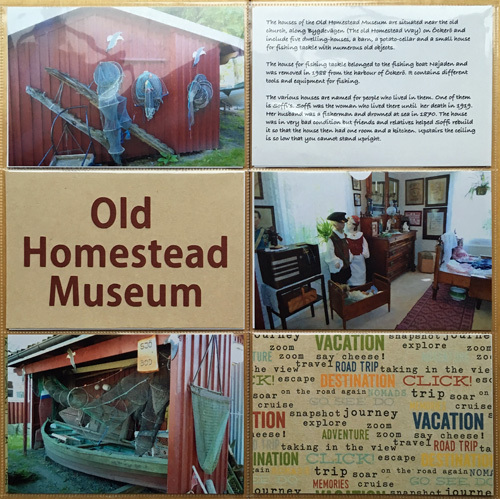 I want to tell the story of our adventure so in future years I can look back and easily remember all the details. I guess that’s the main reason that I scrap. 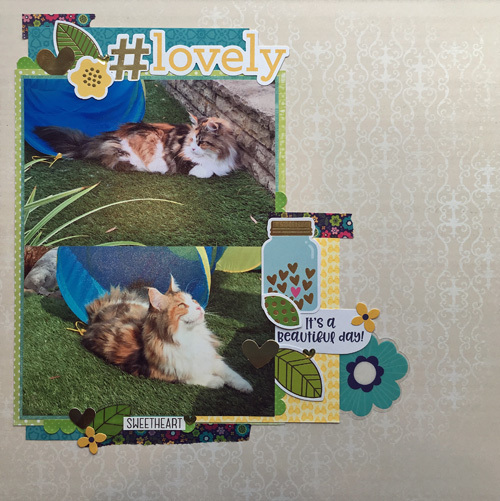 I’m still playing with those lovely Doodlebug papers and have done a few more layouts of the cats. 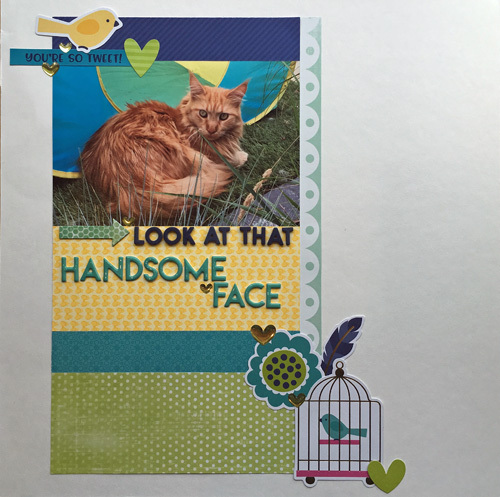 While I was getting all those cruise photos printed, I took advantage of the offers to get some more of the cats done. 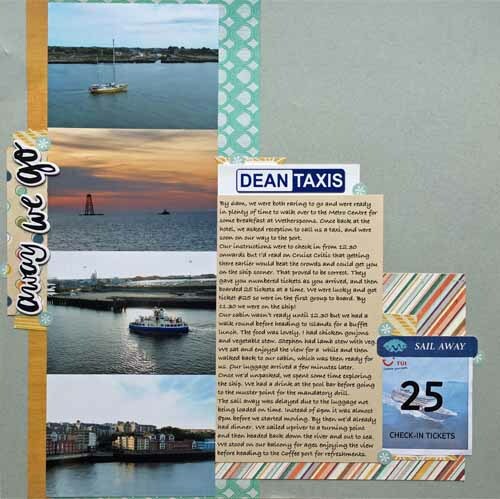 Most of these are scraplifts of layouts by Rachel using the same papers over on the Hey Little Magpie blog. 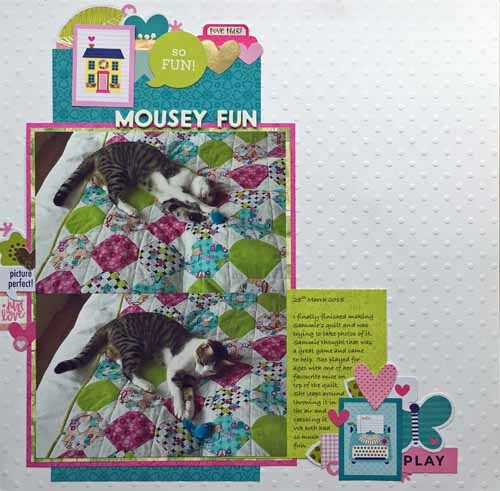 Categories: Cats, Scrapbooking | Tags: Doodlebug, Scrapbooking | Permalink.